Heather Parker is the chairperson of the Peterborough History Group. Here is an article about Bob the Railway Dog published in 1892 by the Victorian Kilmore Free Press. “There was a distinguished visitor and one which attracted marked attention of the railway station the other day in the shape of “Bob the Railway Dog”(says the Ararat Advertiser). Amongst railwaymen Bob is perhaps, the best known free pass traveller on the colonial lines, and he is welcomed at all stations where his predilection for travelling takes him. Bob is of the Russian Retriever breed, a remarkable looking shaggy black dog, and he has on his collar a brass plate and his registration number et c., whilst on the plate the following dog-erel is inscribed, ‘Stop me not, but let me jog, for I am Bob the Driver’s Dog”. The animal’s coat is streaked with grey, for he is in advanced years. At one week he is heard of at Broken Hill, at the next he is in Mt. Gambier, and perhaps in a few days he jumps off the engine at Sydney to find that he is well known and welcome. He came in with the Maryborough train and was desirous of going out on the 4.9pm for Melbourne, but he was detained until evening and left by the Adelaide express with Mr. Primrose . Though aged, Bob is a very lively and sagacious animal, and he seems more at home on a tender or platform than anywhere else”. When Bob died in 1895 he was already part of Australian folk law and his adventures were legendary. He had so many friends and admirers and everyone it seemed was an authority on his life. From time to time the stories vary. For example, his breeding - described in the above article as Russian Retriever. Bred by a Henry Hollamby of Macclesfield from an Old English Sheepdog and a German Collie owned by a Mr T Oakley. Here is another re-telling of the adventures of Bob the Railway Dog from the Advertiser, August 30th. 1895 and is an excerpt from one of the many obituaries that appeared in Newspapers all over Australia - and even overseas! I find this particularly interesting because it names some of his friends who helped him on his travels. Bob seemed to have had a nose for important occasions and made his business where he could, to be there! We know that he was an important guest at the banquet in the old Peterborough Town Hall to celebrate the opening of the Petersburg/Broken Hill line. Here are two more stories. And he may have been at the Melbourne Cup in1886 as reported by the Portland Guardian, November 10, 1886! A report of the huge numbers attending the Melbourne Cup (100,000) many by train, puts Bob in the South East on a railway platform. enable him to return to Adelaide without falling into the hands of the ‘sharpers”, unlike the numerous “unlucky dogs” who become victims at Cup time”. (actually he arrived the day before on the long journey from the Adelaide Hills with his creator Silvio Apponyi. 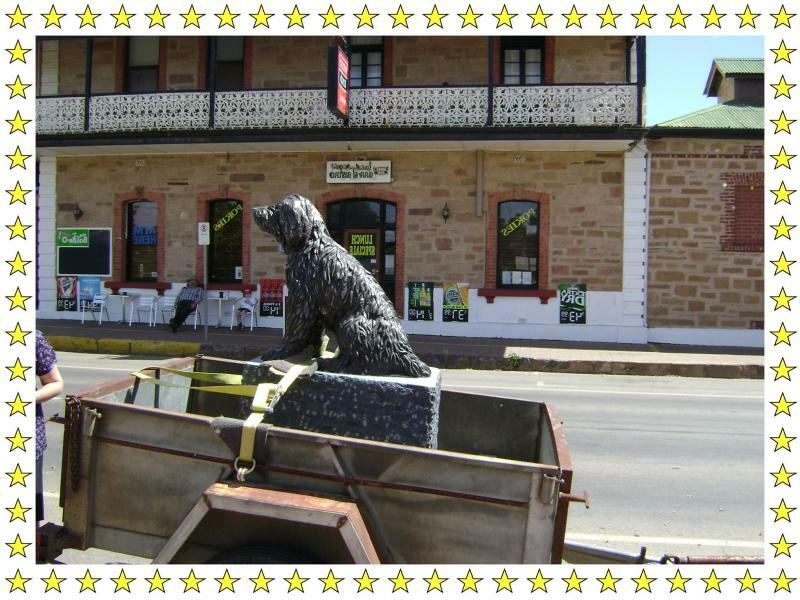 You can see him in the photo on the back of the Ute. Silvio left him uncovered so that “he could see where he was going”- much to the delight of people along the way). In Bob’s earthly life his date of birth remains unknown. As far as I can calculate it would have been sometime in 1883/4. November the 20th. seems as good a date as any to celebrate his birthday so....... HAPPY BIRTHDAY BOB THE RAILWAY DOG! I have been giving Bob’ Garden a tidy up in preparation for another Bob related milestone. Peterborough community and the Peterborough District Council. The 3 pink “Children's Rose” standards are in full bloom together with the 4 pink “Bonica” bush roses, while the rosemary, lavender and salt bush hedge continue to flourish. It has become a beautiful memorial to Gail and her determination to see Bob return to Peterborough. Bob will wear his pink scarf on November 13th, 2012. in memory of Gail. TROVE is releasing digitalised newspapers from around Australia. Most recently the Adelaide Chronicle. This article appeared in “The Little Folks Page”, from “Aunt Dorothy’s letter”, The Chronicle Thursday June 13, 1929. “Aunt Dorothy” wrote to and received letters from children all over this State for many years. Here is another article about Bob from the “The Little Folks Page”, “Aunt Dorothy’s letter”, The Adelaide Chronicle, issued on May 30th. 1914. With thanks to Trove, Australian National Library. “For many years bob was a familiar figure on trains all over this state. He was welcome in every porter’s room in South Australia and his friends never knew when he would gravely walk in the door as they were eating their lunch or resting when off duty for a while. One week he would visit the men at Serviceton, or next the porters and guards at Oodnadatta would be cheered by his friendly prescence. His “pass” took him over every line. Cockburn today, Port Pirie tomorrow, Victor Harbour and Port Augusta were all places where Bob knew he had friends. From his position in front of the Peterborough Tourist carriage Bob’s cheery grin continues to offer a friendly greeting to all who pass by today. “Sometimes for weeks he would not go far from town, but enjoy a ride to the Port or to Semaphore. He always took notice of anyone who spoke to him. If he were lying on the Railway Station platform of any town waiting for his train to start, or making up his doggy mind as to where he would go for his next trip, he would always rise if someone spoke to him by name, walk across to where his greeting friend stood and quietly stand by him to receive the pat on the head and the pleasant word that he expected, - and received, with a pleased wag of his tail. He expected friendship and generally got it but if once he was ill treated by any one he never forgot it and never once again responded to the greeting of the unfriendly man, woman or child. On one occasion the man in charge of one of the stations on the Northern Line was in a bad mood, when he came across Bob lying on the station in the sun, waiting for his train to be ready for him. Feeling short tempered that morning he kicked Bob out of the way as he passed. Thanks to technology, today we are able to easily access news from the past. TROVE digitalised newspapers, Australian National Library, have amongst their titles The Bunyip (Gawler SA: 1863-1954). In it I have found this early account (February 11th. 1887) of our Bob! I noticed on St Patrick’s Day that one of Bob’s friends had dressed him suitably to celebrate the occasion- in shiny green sunglasses and scarf! “The Petersburg (Peterborough) railway station was always one of my favourite watering holes. This is where Will Ferry took me on my first train ride – and you all know what that led to! And so my tail wagged with pleasure when I saw it in all its remembered detail next door in the YMCA building. Mary and Eldon Zimmermann have created this wonderful scale model using bricks and timber sourced from the original building. That’s me you can see on the platform (alongside the water bag hanging from the verandah). Come along and say “hello” sometime, I’d love to see you!